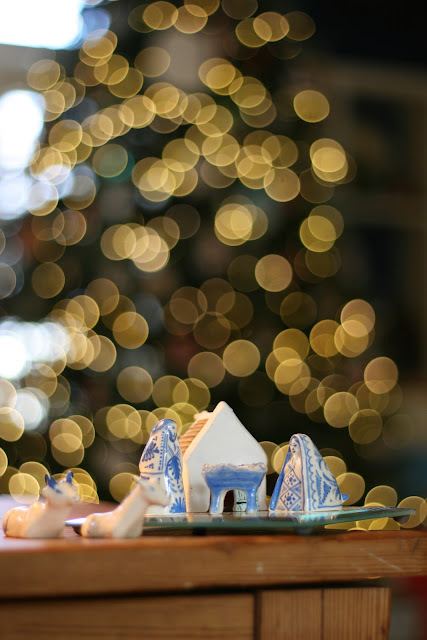 Before Christmas gets too far behind us, I thought I'd share some of my photo experimentations with bokeh. My parents' lovely tree provided the perfect background to play with this effect, so I went to town while we were there. If you have no idea what I'm talking about, have no fear. I'll explain it as best I can (as a non-pro photographer!). Bokeh is simply a fancy word that has to do with blurring the background of an image. Of course, this can be a part of the composition of any photo, but the cool part about taking photos around this time of year is the chance to capture beautifully blurred circles of light in the background because of Christmas lights. See how the present is in focus in the foreground while you get that pretty glittery-light effect in the background? That's the bokeh effect. There are a few keys to achieving this (again, non-professional here! ), so I made a list of what I've found works best. These tips are for DSLR users - I'm not sure how you'd achieve this with a point-and-shoot. If you do, leave me a comment because I'd love to know! Place your camera in "aperture priority mode." I have a Canon, so for me, this is the Av mode on the settings dial. This will allow you to change the aperture, but the camera decides the shutter speed for you. Set your camera on its lowest f-stop (or widest aperture). I have a Canon EF 50mm f/1.8 prime lens (which I also mentioned back in this post), and I find that it works great for achieving this effect. I set my aperture on 1.8 for all of the photos in this post. This will make it so that your camera focuses on what's in the foreground, and blurs the background significantly. Place the object you want to remain in focus (in the foreground) closer to the lights for smaller circles of light, and farther away for larger circles of light. For the photo above, the present was probably 6 feet away from the tree. Play around with different objects, distances and aperture settings - see what you like best! You can see in the shot above that the lights are larger, blurrier, and overlap more. That's because my foreground object (the cows, here) are more like 8-9 feet from the tree instead of around 6 like the earlier photo. I got such a kick out of taking these shots. It's really amazing what you can do with a little patience, a little practice, and a good camera! Like I said earlier, I am not a photography pro by any means, but I have had a few years of practice and feel like I am learning more all the time. If there's something you have a question about from this post, or anything I can clarify, let me know by leaving a comment. I really do love hearing from readers!